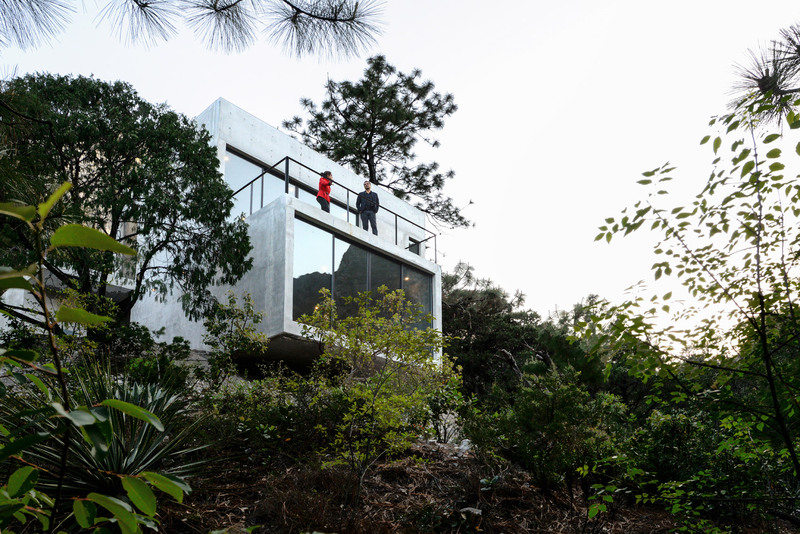 Monterrey-based studio P+0 Arquitectura has wrapped concrete terraces and staircases around this residence to make the most of its setting among wooded mountains in Mexico. 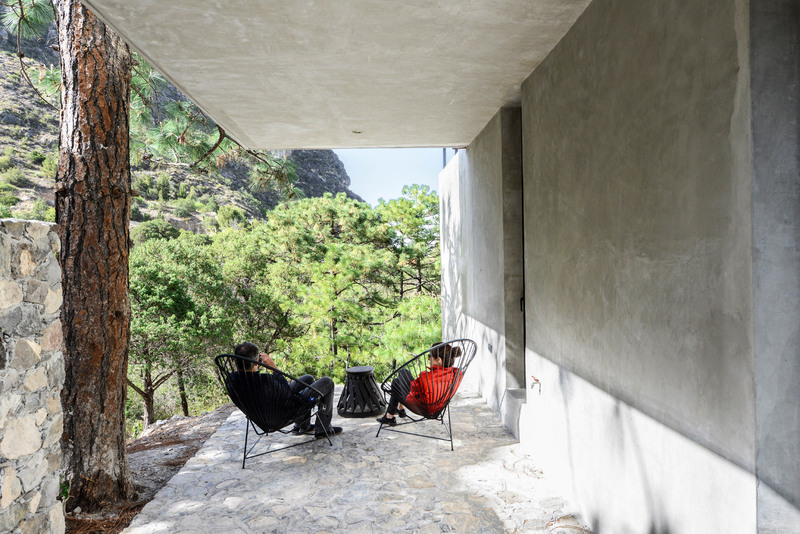 Called Casa 2I4E, the residence is set on a sloped site in the hillside of El Jonuco, northwest Mexico. 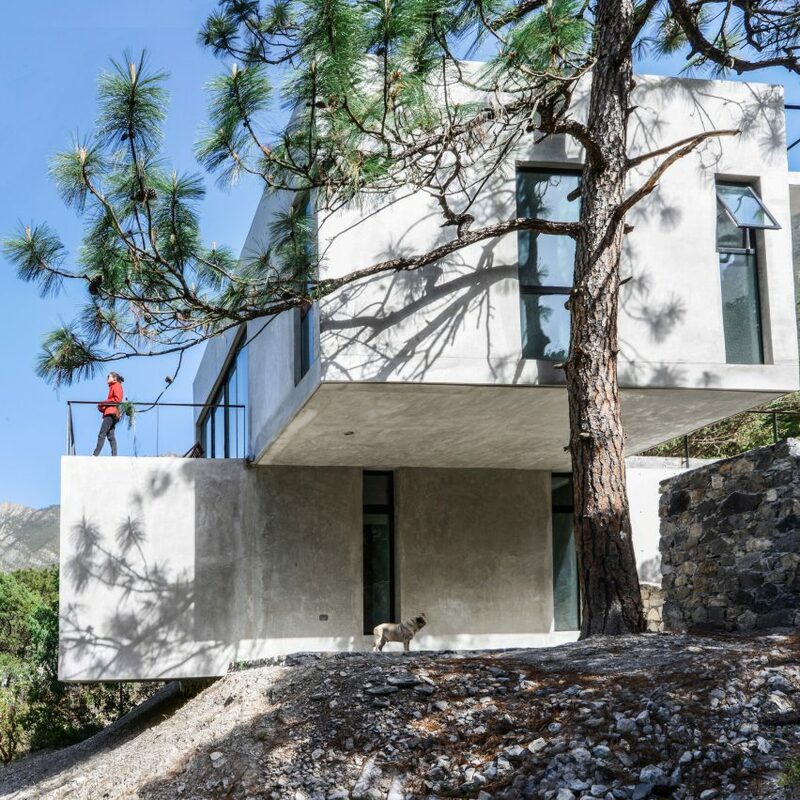 Designed as a holiday home for a couple – shown in photos with their canine companion – the property comprises two “simple and independent elements placed one on top of the other”. 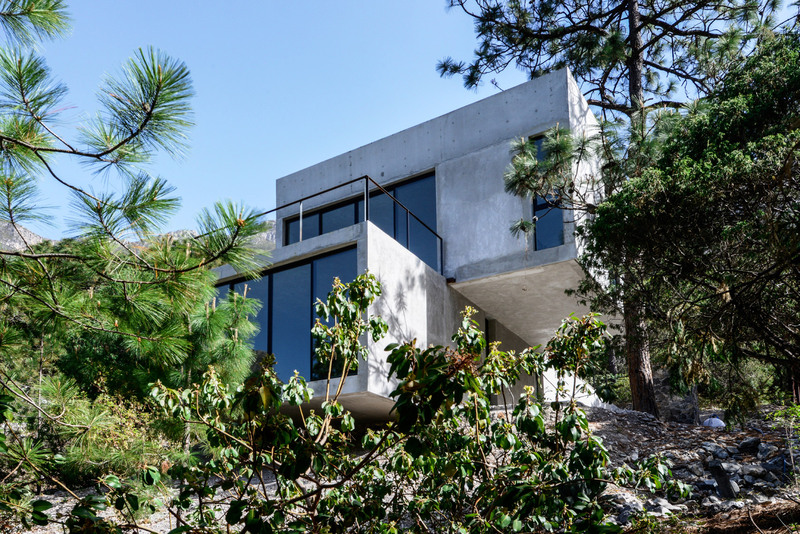 A larger concrete block protrudes from the hill on the lower level, while the smaller volume above extends out to face a different direction. The offset arrangement creates a series of terraces and patios in between for the residents to enjoy the outdoors. 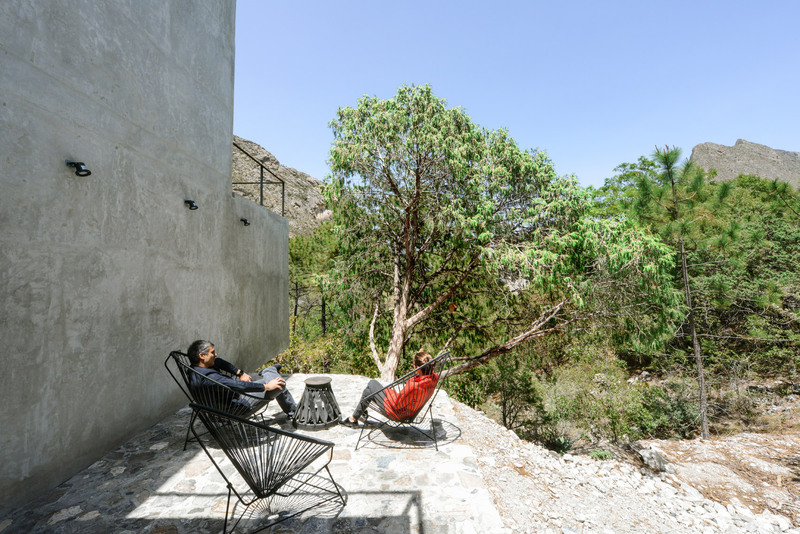 “The connections between them and the relationship with the surroundings generate four outdoor spaces to enjoy the landscape,” said P+0 Arquitectura in a project description. 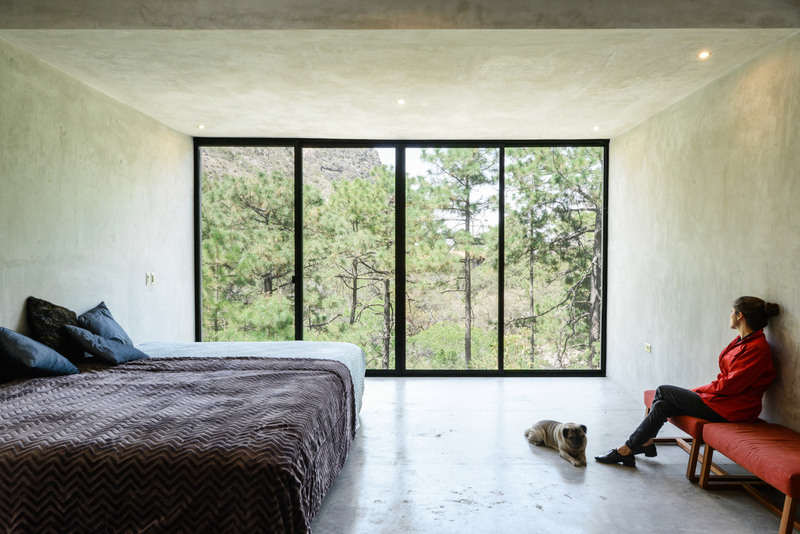 Casa 2I4E features an exposed exterior intended to subtly blend with the hues of the surroundings. A pair of patios paved in local stone offer “a rustic finish” that draws on the nearby rocky terrain. One of these patios is covered by a protruding portion of the structure above, and forms the main entrance into the residence, with a large tree growing beside it. The other is more secluded and open to the sky. 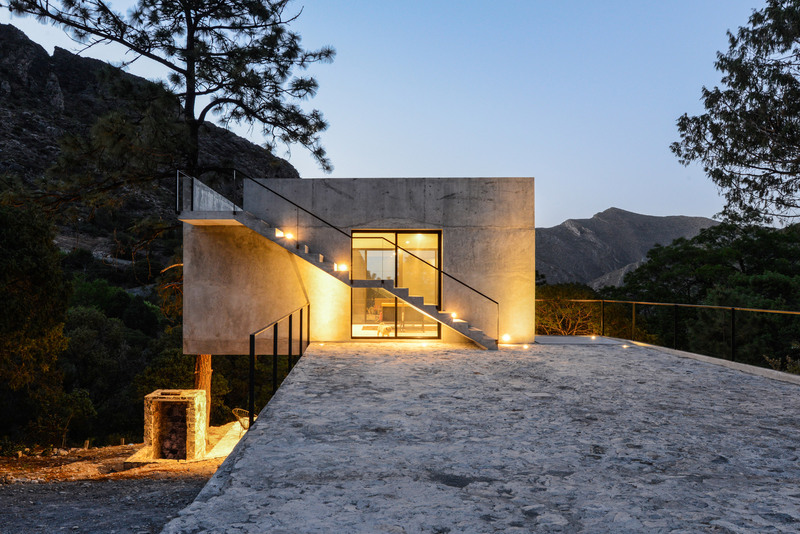 Two concrete staircases lead from up the side of the lower volume to a large terrace atop. A second set of steps then runs up the smaller upper volume onto its roof – offering the “the most impressive views of the land”. The main living area occupies the top volume, while the couple’s master bedroom and en-suite is located on the floor below. The lower level is partially burrowed into the hill at one end, and then pokes out over the sloped site to face the forest. 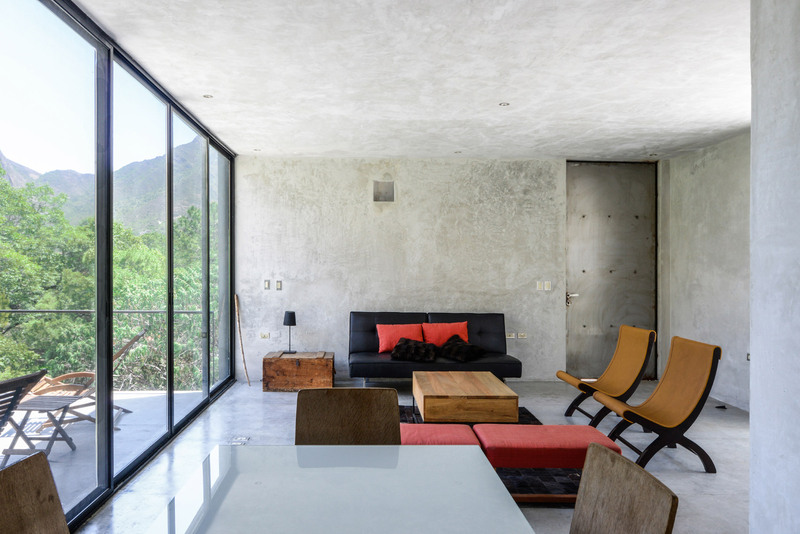 A large window punctures the end wall to make the most of the scenic vista from the inside. Inside, the finishes are kept simple. 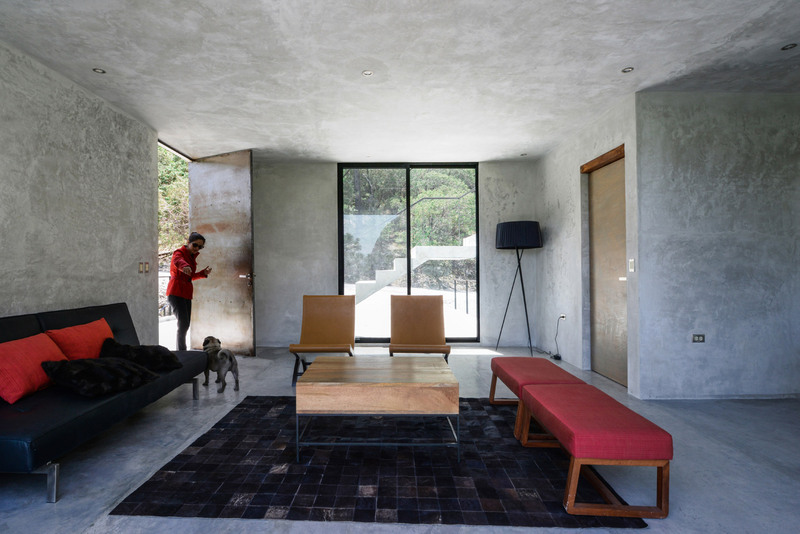 Polished concrete surfaces continue throughout, only interrupted by wooden doors, and large black-framed windows that offer views of the landscape. 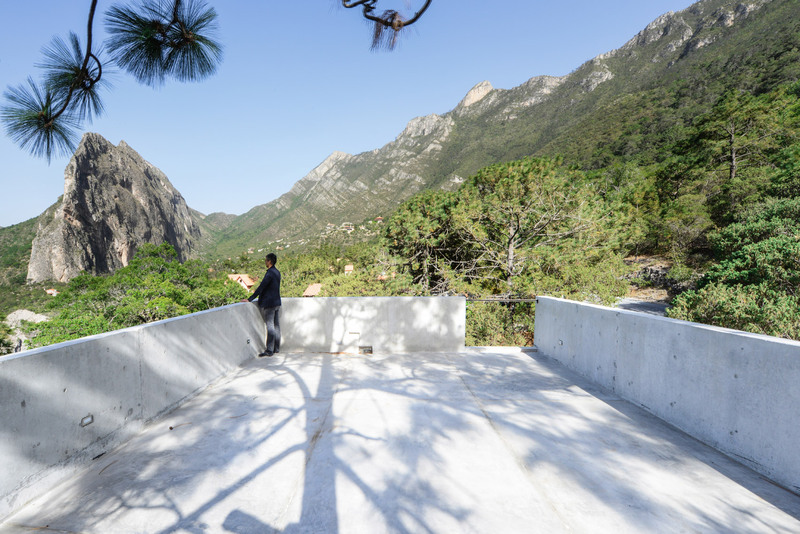 “The floors were made also in concrete generating a neutral and clean aesthetic that underlines the beauty of the landscape,” said the firm. Furnishings are sparse, with the decor in the living room including a dark rug, a wooden table, a pair of curved leather chairs and a large standing lamp. The bedroom is decorated with a double bed and two red chairs. 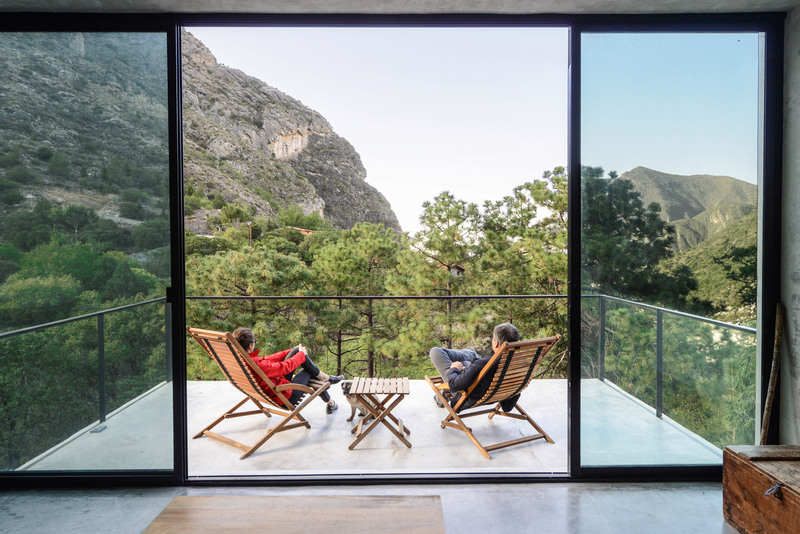 P+0 Arquitectura’s simple arrangement of Casa 2I4E is a scaled-back version of the initial proposal for the residence. The firm intends the house to “grow over time”, which will involve turning the two built volumes into bedrooms suites, and the addition of a third volume linked by a “bridge”. El Jonuco is an idyllic setting located in Mexican state Nuevo León. 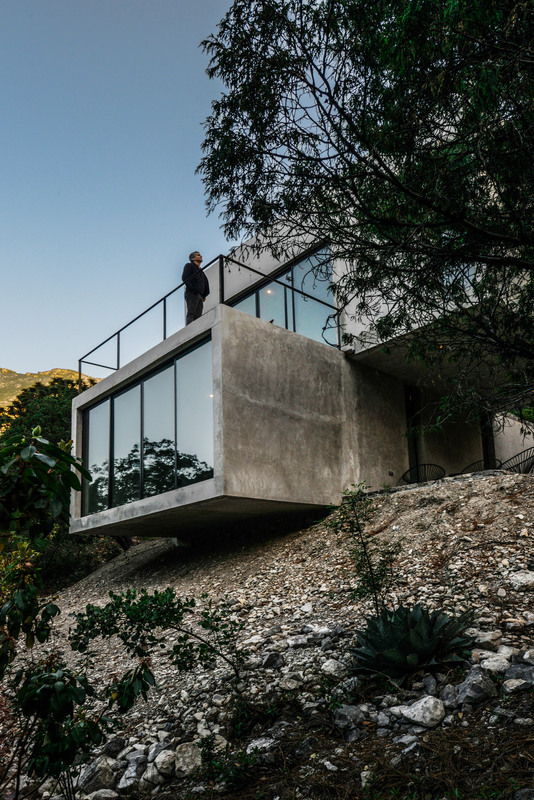 Mexican architect David Pedroza Castañeda has also completed a red concrete house in the area, which similarly comprises a series of overlapping and cantilevered volumes to make the most of the surroundings. Photography is by FCH Fotografia. 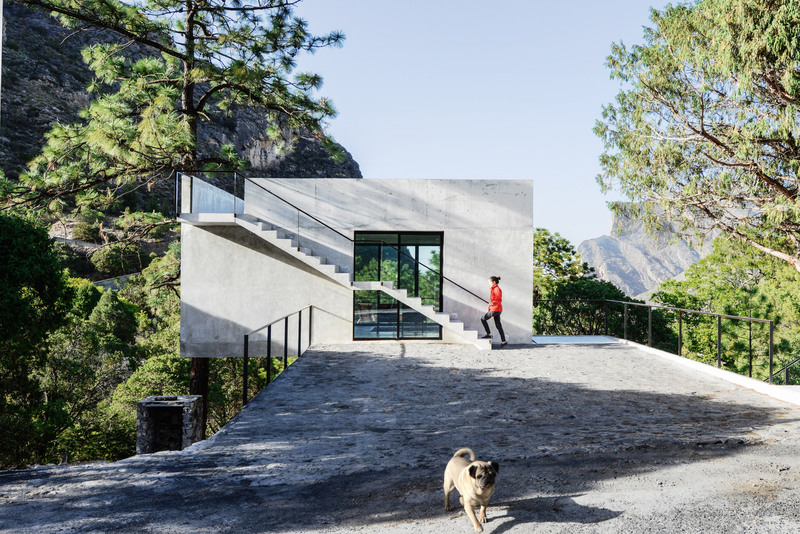 The post Offset concrete boxes form Casa 2I4E retreat for a couple and a dog in Mexican landscape appeared first on Dezeen.